The kids and I settled down to a movie on Easter day. Our choice? Princess Cut, which I had received from Watchman Pictures for review. We enjoyed this family-friendly film, and I especially enjoyed that I didn’t have to worry about inappropriate language or scenes. 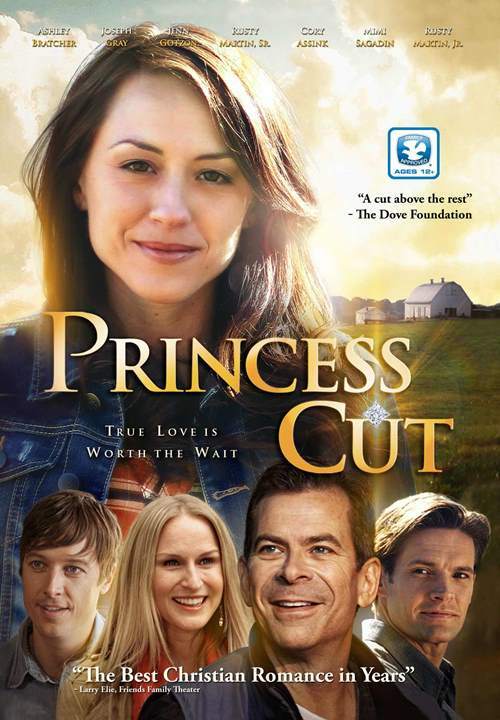 Princess Cut follows the story of Grace, a young woman in her twenties who lives at home with her family. Her dad makes his living as farmer. Grace longs to be married, and she hopes that her boyfriend, Stewart, who is home from college and has something important to tell her, may pick this night to propose. Instead, he announces that he’s engaged to someone else. This event sends Grace on an adventure. Who is the right one? How will she know? Grace has vowed to keep herself pure before marriage, so when her next boyfriend, Jared, pushes her for more physical interaction than she is comfortable with, Grace feels confused and anxious. In the end, she decides that Jared isn’t the right one for her because he doesn’t respect her, her family, or her values. Luckily, Grace does find someone who treats her the way she likes, but Jared is not quite ready to give up on Grace, leading to an interesting climax in the movie. There were some parts of the film that I would have liked to have seen explained further. For instance, Grace is blindsided when her boyfriend comes home from college and announces his engagement to another woman. How is that possible? I found myself wondering how closely she was in contact with him while he was away. How did she not know something like this? Also, Grace’s best friend is the complete opposite of Grace, which also surprised me. I wondered what they based their friendship on since they were so very different. However, overall, we all liked this film. I liked that I could watch it with all my kids (ages 7 to 13) without feeling uncomfortable or worrying about inappropriate scenes. The topics also gave us good fodder for discussions about relationships and how men should treat women when they’re in a relationship. Our kids, who watch Hallmark shows, felt that this had the feel of a Hallmark movie, which was a bonus for them. The film is about one hour and forty minutes long, so we could easily watch it in one sitting. I also appreciated that Grace’s family wasn’t portrayed as perfect. Her father has financial stress when it comes to the family farm, Grace loses her temper with her little brother, and Grace doesn’t always open up with her parents about what is happening in her life. If you’re looking for a family-friendly movie, I highly recommend this one.